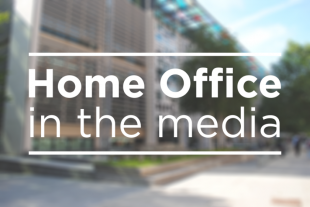 Today’s Home Office stories include the announcement on new Knife Crime Prevention Orders, a right to rent case and the Supreme Court ruling on criminal records. There is widespread coverage of the Home Secretary’s announcement of new Knife Crime Prevention Orders to help police tackle knife crime. The Telegraph carries an op-ed from the Home Secretary in which he says that police should have all the powers they need, and he is redoubling efforts to put an end to violence on the streets. He references concern for his own daughter when she is out with friends and his first-hand experiences of meeting victims of violent crime. He goes on to say that he is doing everything to stop the ‘worrying rise’ in serious violence and that is why he has invested more than £220 million for work on early prevention. The Times states the police could apply to the courts to ban suspects as young as 12 from particular websites, restrict them to their homes, ban them from parts of towns and cities and make them attend knife awareness courses. The Guardian notes that the announcement comes after the Home Office unveiled its Serious Violence Strategy last year which focused on a ‘public-health approach’ and was backed by £40million. · The Mail says that if an individual breaches the ‘ASBO-style’ orders they may be sent to prison for two years. · The Telegraph notes that as part of the new announcement a £500,000 fund has been launched as part for the Trading Standards teams to pay for prosecutions against shopkeepers who repeatedly sell knives to people under 18. The Independent reports that a British man and his family face homelessness after being told that his Russian wife does not have the right to rent property in the UK, despite having the rights to reside in the country. After putting a deposit down on a property, Rory McCormick was told by his estate agents that his wife’s Irish residency card would not be accepted under the Home Office’s right to rent guidance. According to the article, Chai Patel, legal policy director at the Joint Council for the Welfare of Immigrants, accused ministers of making immigration officers of teachers, doctors and estate agents through the hostile environment. An Article 10 residence card issued by the Republic of Ireland helps to demonstrate a right of entry into the UK. It does not confer the right to rent in the UK. If an individual has applied for but not yet received a UK permanent residence card, they should have the right to rent in the UK. As made clear in our online guidance for landlords, in such cases prospective landlords can use the Landlord Checking Service to provide confirmation of an applicant’s right to rent. We are writing to the family in this case to clarify their position. There is widespread reporting on the Supreme Court ruling yesterday regarding the disclosure of minor offences on criminal records. According to the reports, thousands of people with minor or old convictions could be freed from having to declare them to employers in children’s and other services after the judgment. The court ruled that the current requirement for all previous convictions to be disclosed, however minor, where the person has more than one conviction, and in the case of any warnings or reprimands issued to young offenders, is disproportionate. We have noted the Supreme Court judgment and will consider the ruling carefully before responding.